Ok so lalaland is doing contests for kids so me and my 8 year old sister Rachel are doing it. Contest was for the colours of your flag ,We are in England but we decided to do the union flag as there are more colours available , here is Rachel's card. Your card Rachel is Amazing with the flowers and the number 1!!!!! We have never had entry from England and that is awesome I am from Aussie and Good luck!!!!! Rachel says thankyou Darcy,i have shown her yours and she thinks its really pretty.She says that she thought every card there was England until I told her that most of the flags are red blue and white in the contest/challenge. thank you for entering Rachel's card into the contest too Ollie!! 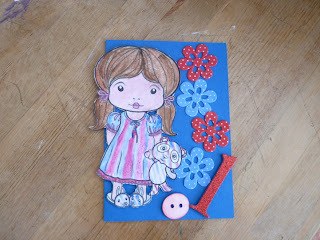 Rachel, your card is fabulous, I really love how you have coloured in Marci's dress, very striking! Rachel isn't home right now ,she is at school but I will tell her what you said later sue,thankyou for looking. Your card is so pretty! I love the stripes on the dress and the flowers on the side! Thanks for playing!